The first thing you need to do is login. If you do not have an FIU MyWeb page, one will be created for you automatically. Log into the main FIU MyWeb page at the “Register a New MyWeb Site” image on the Home page. 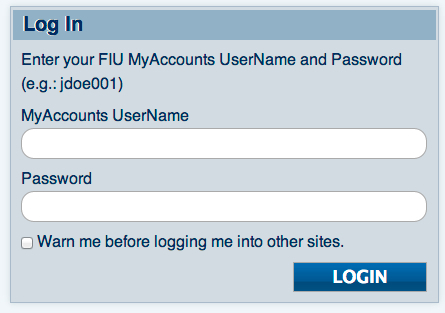 You will need to enter your FIU MyAccounts username and password at the login screen. If this is your first time logging into FIU Mysite, you will be asked to agree with FIU policies. You MUST agree to the policies before going on. University policies on computer use are listed in the student handbook, and apply to every aspect of FIU MySite web pages. Then you will be given links to your Dashboard (where you create and edit pages) and the site itself (where visitors to your site can view your pages). If you try to login on the main webpage after already creating your site, you will get this. This means that you logged into the Main site, not Your site. No worries, just click on Visit Dashboard for your own site. Be sure to bookmark the address for your website and dashboard.